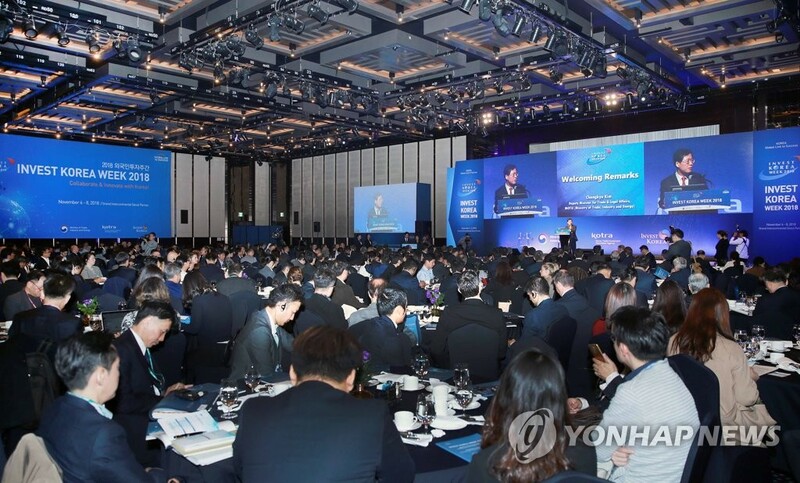 SEOUL, Nov. 28 (Yonhap) — New foreign direct investment (FDI) pledged to South Korea has surpassed the previous record high, led by rising interest in the nation’s high-tech industries and startups in emerging sectors, government data showed Wednesday. South Korea received US$23.04 billion worth of FDI commitments as of Tuesday, already breaking last year’s $22.94 billion total, according to the Ministry of Trade, Industry and Energy. The actual investment made by foreign companies so far reached $13.79 billion, also exceeding the annual amount in 2017. Investment pledges from the European Union jumped 24.4 percent on-year to $7.1 billion as of Tuesday, mostly in the form of stake investments and merger and acquisitions (M&A). American companies sought partnerships and acquisitions in high-tech industries and tech start-ups, pledging $5.1 billion over the period, a 37-percent surge. New FDI commitment from China rose a whopping 252 percent to $2.56 billion, led by brisk investment in the service industry. By sector, the manufacturing industry drew in $9.27 billion of investment pledges, and the service sector attracted $12.6 billion so far this year. The ministry said the eased geopolitical risk on the Korean Peninsula, as well as robust demand for memory chips and petrochemical products, created a favorable business environment for foreign investors.